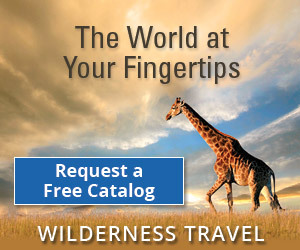 Namibia’s wildlife is astoundingly diverse. As we explored the country, we saw animals of almost every shape imaginable, from the short-stacked warthog to the elongated, strangely-elegant giraffe (my favorite animal to watch). Red-eyed bulbul, guineafowl, and springbok were common sights on our game drives and the rarer creatures, like leopard, made appearances as well. Even contrasts between similar species were striking. Mountain zebra are black and white, while the plains zebra have brown stripes interspersed on their hindquarters (mountain zebra are also much cuter). All of the antelope species’, like impala, kudu, and hartebeest, beautiful horns have distinct and diverging shapes. 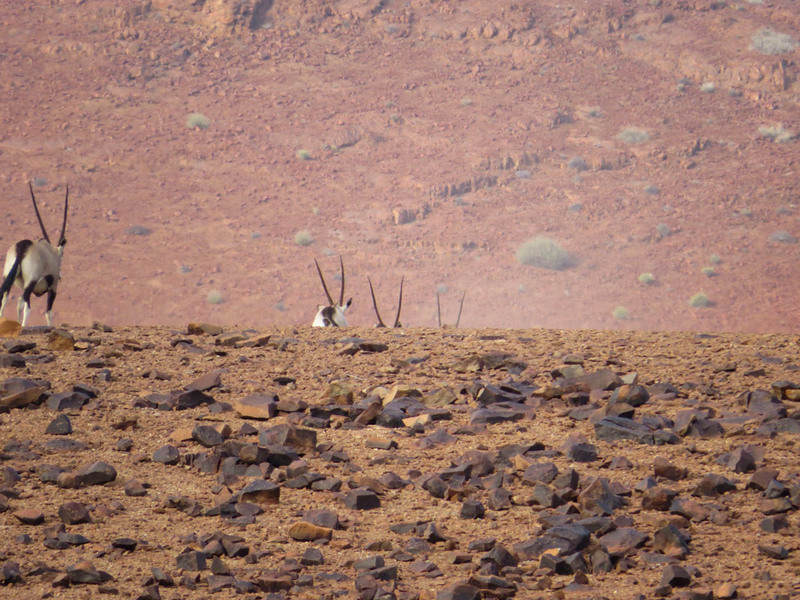 We saw lots of the stately gemsbok, or oryx, an antelope that appears on the Namibian coat of arms. 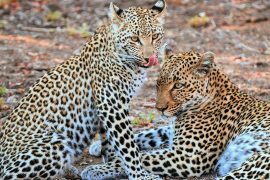 One of our trip themes was conservation and our first visit exploring this topic was to the Africat Foundation, which focuses on conservation education for children. 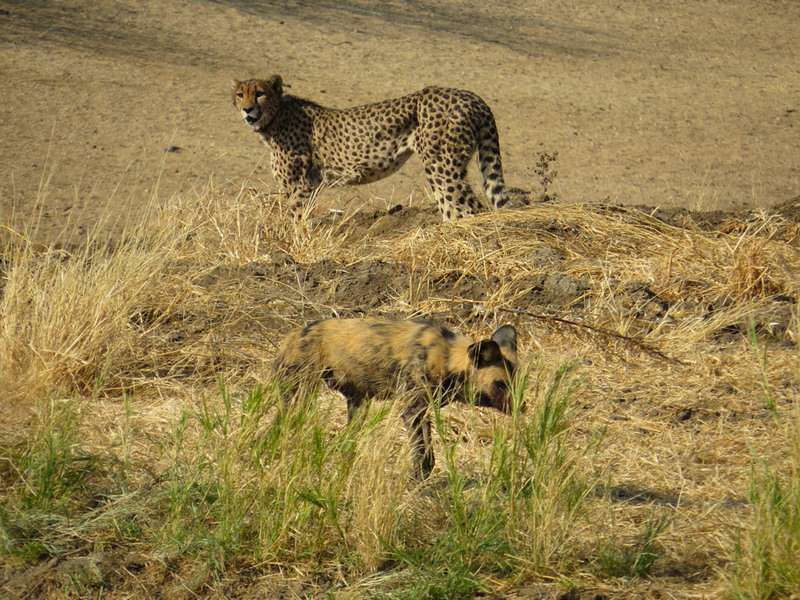 On Day 2 at Africat, we went on a cheetah spotting drive. We saw some steenbok, a lone (very nervous) wildebeest, a crimson-breasted shrike, and a cheetah. After we watched the cheetah for a bit, we were headed back toward the car when the guide spotted a kudu running. We ran into a little swale and up a small hill to get to a place where we could see what was going on. The kudu was being chased by a pair of African wild dogs and was severely, probably mortally, wounded by the time we got there. However, our cheetah came over to try and contest the kill. 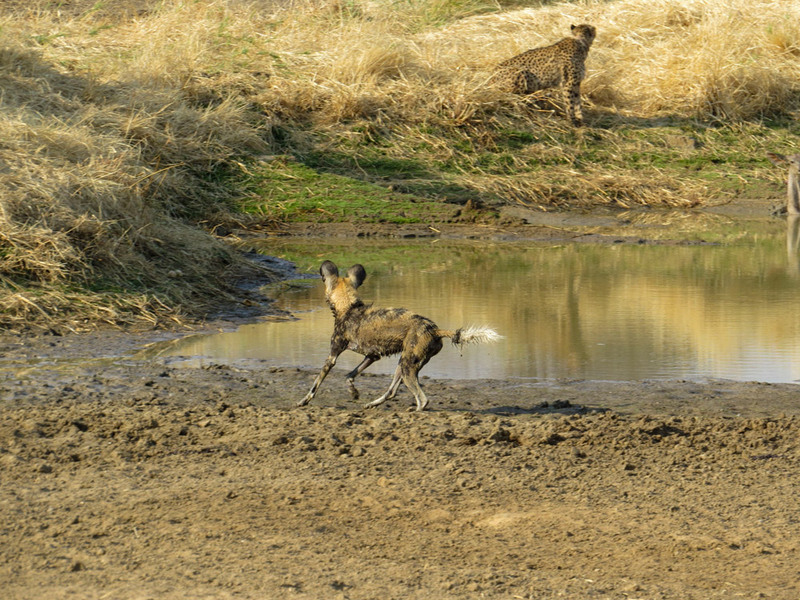 This led to a lengthy standoff where neither the dogs nor the cheetah felt they could finish off the kudu as they had to keep an eye on each other. Meanwhile, as this protracted, difficult-to-watch drama was unfolding, there were duckies swimming maybe 30 feet away from the kudu. 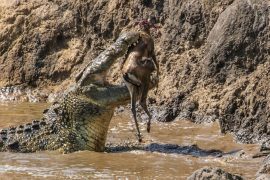 Eventually, the cheetah gave up. 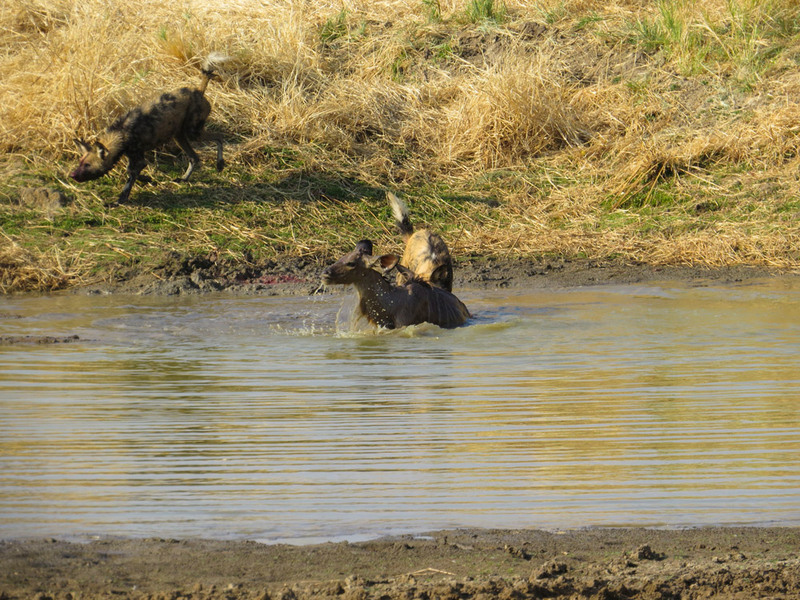 The dogs lay down for ten minutes or so to rest up, then FINALLY went back and finished off the poor kudu. 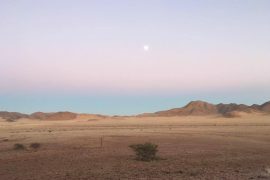 As we continued into rhino territory, we spotted a steenbok who was missing a horn, and a welwitschia, an incredible flowering conifer that is in its own order (Welwitschiales) and can live for hundreds, some thousands, of years. Like the gemsbok/oryx and the fish eagle, welwitschia are on Namibia’s coat of arms. Continuing our theme of finding what we were not looking for, we went off on a rhino search and almost immediately came upon a pair of rare desert lions. Funny thing is, the next day we were scheduled to meet desert lion expert Dr. Flip Stander, to observe and learn about his work. 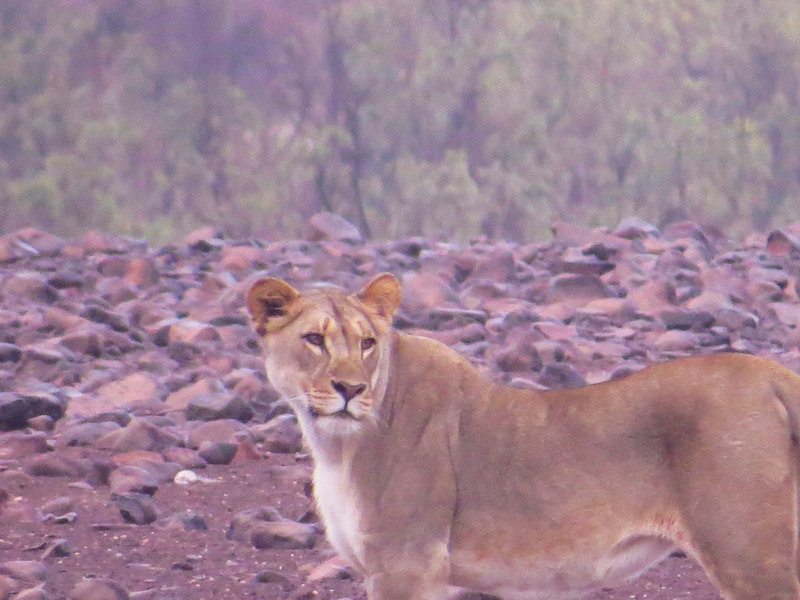 We happened to come across him later that day and were able to give him the exact time and place of the lion sighting. It turns out he was looking for those very lionesses, as the collar one was wearing was malfunctioning. With our information, he was able to find them and get the collar changed that night. 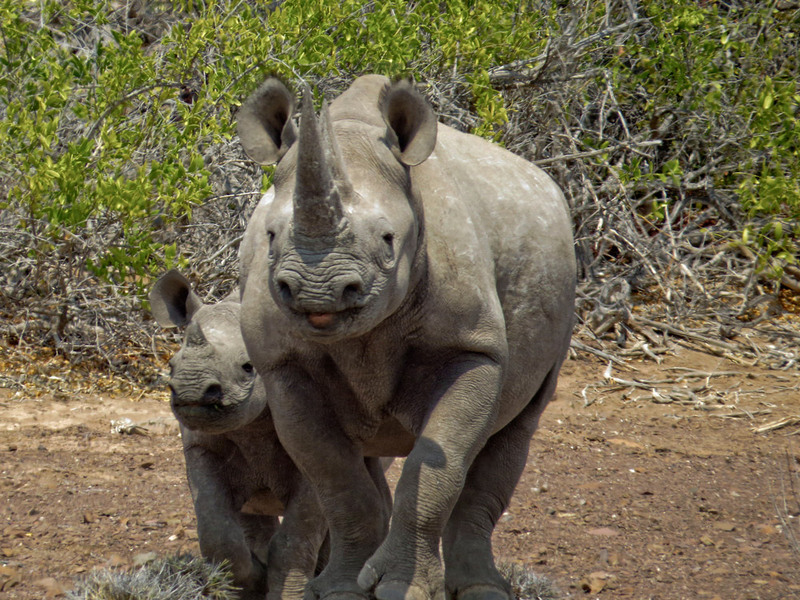 Later, when it was time to look for desert lions, we found, of course, rhinos.